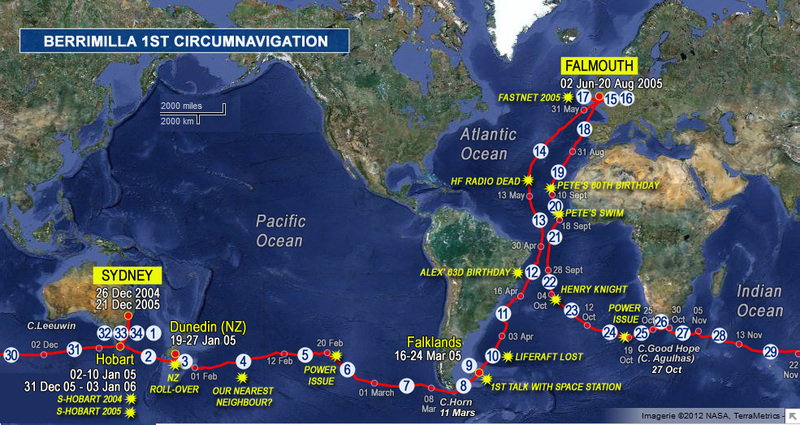 These are all the logs emailed from Berrimilla by Alex Whitworth and Peter Crozier as they circumnavigated the globe, with 2 Sydney-HobartSydney-Hobart Race: often described as the most gruelling ocean race in the world, this annual race starts on 26th December from Sydney Harbour and ends in Hobart. The course is 628 nautical miles. and 1 FastnetFastnet Race: 608 mile biennial race from Cowes, UK, Isle of Wight, to the Fastnet Rock off Southern Ireland, finishing in Plymouth. Berrimilla took part in 2005 and 2009. races thrown in for good measure. (Dec 26, 2004 – Jan 9, 2006). Read what they are saying about Berrimilla’s logs.